Important Letters from Capt. Adolph Nolte – A Graphic and Concise Description of the Great Battle – The Irrepressible Thirteenth in Action – Their Achievements – No Reinforcements – The Retreat, Etc. Camp Union, July 23, 1861. As you perceive from this letter, we have returned sooner from Virginia than we entered. – In entering we occupied three days; for leaving, one night. Nevertheless, we can maintain that we have lost the battle with honor, and that the cause of our defeat is owing to nothing but the defective disposition of our forces, in lack of ammunition, and to the fatigue of our troops. The general course of the battle you will learn in detail from the newspapers, and the official reports. So I will inform you briefly only as follows. From 7 o’clock in the morning, till 3 in the afternoon, (of Sunday,) we drove the enemy out of every position. He made a stand nowhere in the open field. The flight and pursuit continued over hill and dale, through valley, defile and forest, until we came upon his strongest batteries, at 3 o’clock, three miles this side of Manassas. Instead of resting the troops, who from 2 o’clock in the morning had been upon their legs, in the most terrible heat, almost unprovided with water, and very little biscuit, they were ordered to storm the batteries lying opposite. In the enthusiasm of victory they rushed fiercely upon them. However, they were received by a fearful fire from heavy artillery, and from firmly placed batteries, at which the company had (???) a stand. Our artillery, light six-pounders, began to play against the heavy artillery of the enemy. But their heavy caliber was immensely superior to ours, and our ammunition, which had been employed during the day, was lulling. From this moment forth, we were in the hands of the enemy, who rained upon us a hail of balls, bombs and schrapnels, as far as their heavy artillery could reach. Nevertheless, we advanced one more, about half of a mile, and captured one of the nearest posted hostile batteries. However, we could not retain it without artillery, and were compelled to get out of reach of the enemy’s artillery, after being completely showered with a flood of balls. Here we met with te severest blow. We had no reserve, neither infantry or artillery, which could have stood against the enemy, and behind which we could have reorganized. Our battalions were, singly, as they advanced, thrown against the batteries and driven back. Of a reserve no one had thought. Now every one knows, who has any knowledge of war, that dissolved battalions behind sufficient reserves, upon the battle field, can again be brought to a stand and to order – but never when they are upon the march. A retreat followed, and from this moment forth, were all the regiments and arms a promiscuous, irregular heap – tired to death, and retreating upon the narrow mainway, blockaded by hundreds of wagons, and through the close woods. Now, with reference to our regiment. We left our camp Sunday, the 21st, at 2 A.M. After we marched a few miles we met the enemy. Our position was at the extreme right wing – beside the 69th and 79th. After we marched a few miles, we met the enemy. After that the artillery had opened fire, and several regiments of the rebels had been scattered by well-thrown grenades, and after that Lieut. Hunter’s brigade had flanked the enemy on the left, we advanced and drove the enemy by our fire. They nowhere made a stand. They were defeated everywhere, and the pursuit was over hill and valley. Having arrived at Bull’s Run – a river not deep, but shut in by steep banks – the most of our troops refused the pontoon bridge and sprang as if mad through the creek. Having reached the opposite hight, our fire commenced anew upon the flying and distracted columns of the enemy, until they got beyond reach of shot. Here Gen. McDowell and Col. Sherman, our Brigade commander, met and shook hands. In the salutations and our hurrah were a little too early. The command to advance was given. Our fatigued regiments, who from 2 A.M. till noon, had been in terrible heat upon their feet, stimulated by the enthusiasm of victory, ran down the mountain and up another hight, when, as we were crossing the summit of the same, we came within shooting distance of the enemy’s chief battery, and the balls began to fly around us thick as hail. We formed division columns and made an advance march down the hill. Here fell two of our company, (the German) the first in the Regiment, the shot striking about three yards from me in the rank. It shivered the right thigh of private Nauth, and the right foot of young Werner. The piece of the shell whirled about our ears like hail. We marched under the continuous rain of balls – which tore down many others of the regiment– to the left over the way, and took position behind a small hight. The divisions of the regiment, changing positions, advanced to the top of the slope and from this fired upon the hostile position. Finally came the artillery, and posted itself upon the back of the hill, in order to answer the fire of the battery. We remained in our position in order to cover the artillery, and had the satisfaction of receiving all the shot which was intended for them. A mass of men fell here. Unfortunately, the artillery had exhausted its ammunition, and returned to the left. We began our fire afresh, advanced over the hill, and drove the enemy through a hollow lying behind, where we took possession of a stone house, which had served them as a protection. From here we advanced through a hollow, up another hight, on whose left side a deserted block-house, surrounded by fences, also served as a defense for the enemy. While we were scaling the fences, Sergeant Becker received a ball in the right shoulder. I held him for a moment, with the assistance of Sergeant Major Schreiber, and whilst the latter was tying him up, I followed quickly to the remainder of our companies, which had just posted themselves behind the above mentioned block house. Already on the advance, was our regiment, likewise the 69th and 79th – entirely separated! Our assault was made, not in column, lines, or any regular manner, but in a promiscuous and confused mass. I met here men from the companies of Capts. Lewis, Williams, Hyland and Lieut. Geck, in confusion. They had posted themselves partly behind the house, partly behind the fence, and fired upon the enemy, whose cannon and musket balls whizzed about us like hail. Here private Bauman fell, hit in the breast by a ball, and breathed his last. This last result WAS THE TURNING POINT OF THE BATTLE. The other wing was thrown back and fled, and so was our little heap – if it were not to be cut down entirely – compelled to seek safety in flight. We retreated across the field toward the defile, and it is a mystery to me to this hour, how one single man got away safely from the awful grape shot and muskety. When I leapt the fence bordering the defile, I was compelled to remain for several minutes behind a small hill, before I could venture forth, for had I during this time only raised my head, it would have been riddled by a dozen balls. At last we got through the valley behind the opposite heights, where the balls from the batteries could no longer reach us. Here I met private Stuermer, whose foot had been smashed, and who had been carried away by a few of his comrades. On the opposite plateau our troops reorganized to some extent, but as we had no reserve, it was impossible to bring order out of confusion. The retreat took place without the enemy’s daring to follow with his infantry. We dragged ourselves, fatigued almost to death, about twelve miles back, towards Centreville, and from thence in the same night, to camp Union. So far as concerns the wounded of our company, we have brought with us but one, Sergeant Becker, who could march. The remainder have fallen into the hands of the enemy. NOT TWENTY OF OUR COMPANY WERE TOGETHER AT EVENING, and I fear that more have fallen than the above mentioned. All the wounded of our company fell at the attack – none on the retreat. Of the whole regiment, I was not able to find together at evening iso much as fifty men.i The rest were scattered in every direction, like the other regiments; and on Monday noon there were not as many as eighty men in camp Union. I regard to the retreat, I shall write in my next, since this letter will otherwise be too late for the mail. We were from Sunday morning to Monday morning on the march, without eating or drinking anything, except a little sea-biscuit and a little dirty water. We were during this time, from seven to eight hours, under fire, and had marched fifty miles. Let those answer for the result who have sent 20,000 exhausted troops, with light, half provided artillery, against an enemy of 60,000, well entrenched, and well provided with the heaviest artillery. I left West Point on the 18th of July for Washington, delaying a few hours that afternoon on my arrival in New York to enable me to purchase, of the well-known military firm of Horstman’s, my lieutenant’s outfit of sabre, revolver, sash, spurs, etc. Taking the evening train for Washington, I found the cars crowded with troops, officers, and men hastening to the capital. At each station we passed on the road at which a halt was made, crowds of citizens were assembled provided bountifully with refreshments, which they distributed in the most lavish manner among the troops. Their enthusiasm knew no bounds, they received us with cheers and cheered us in parting. It was no unusual sight, on leaving a station surrounded by these loyal people, to see matrons and maidens embracing and kissing with patriotic fervor the men, entire strangers to them, whom they saw hastening to the defense of the nation. Arriving at Washington soon after daylight, Saturday morning, the 20th of July, I made my way to the Ebbit House, where I expected to meet some of my classmates domiciled. Among others I found there was Parker, appointed from Missouri, who had been my room- and tent-mate at West Point for years. He was one of the few members of my class who, while sympathizing with the south, had remained at the Academy long enough to graduate and secure a diploma. Proceeding to his room without going through the formality of announcing my arrival by sending a card, I found him at that early hour still in bed. Briefly he responded to my anxious inquiry for news, that McDowell’s army was confronting Beauregard’s, and a general engagement was expected hourly. My next inquiry was as to his future plans and intentions, remembering his Southern sympathies. To this he replied by asking me to take from a table near by and read an official order to which he pointed. Upon opening the document referred to, I found it to be an order from the War Department dismissing from the roles of the army Second Lieutenant James P. Parker, for having tendered his resignation in the face of the enemy. The names of two others of my classmates appeared in the same order. After an hour or more of discussing the dark probabilities of the future as particularly affected by the clouds of impending war, I bade a fond farewell to my former friend and classmate, with whom I had lived on terms of closer intimacy than with any other being. We had eaten day by day at the same table, had struggled together in the effort to master the same problems of study; we had marched by each other’s side year after year, elbow to elbow, when engaged in the duties of drill, parade, etc., and had shared our blankets with each other when learning the requirements of camp life. Henceforth this was all to be thrust from our memory as far as possible, and our paths and aims in life were to run counter to each other in the future. We separated; he to make his way, as he did immediately, to the seat of the Confederate Government, and accept a commission under a flag raised in rebellion against the government that had educated him, and that he had sworn to defend; I to proceed to the office of the Adjutant General of the Army and report for such duty as might be assigned me in the great work which was then dearest and uppermost in the mind of every loyal citizen of the country. It was not until after two o’clock in the morning that I obtained an audience with the Adjutant General of the Army and reported to him formally for orders, as my instructions directed me to do. I was greatly impressed by the number of officials I saw and the numerous messengers to be seen flitting from room to room, bearing immense numbers of huge-looking envelopes. The entire department had an air of busy occupation which, taken in connection with the important military events then daily transpiring and hourly expected, and contrasted with the humdrum life I had but lately led as a cadet, added to the bewilderment I naturally felt. Presenting my order of instructions to the officer who seemed to be in charge of the office, he glanced at it, and was about to give some directions to a subordinate nearby to write out an order assigning me to some duty when, turning to me, he said, “Perhaps you would like to be presented to General Scott, Mr. Custer?” To which I of course joyfully assented. I had often beheld the towering form of the venerable chieftain during his summer visits to West Point, but that was the extent of my personal acquaintance with him. So strict was the discipline at that Academy that the gulf which separated cadets from commissioned officers seemed greater in practice thant that which separated enlisted men from them. Hence it was rare indeed that a cadet ever had an opportunity to address or be addressed by officers, and it was still more rare to be brought into personal conversation with an officer above the grade of lieutenant or captain, if we except the superintendent of the Academy and the commandant of the corps of cadets. The sight of a general officer, let alone the privilege of speaking to one, was an event to be recounted to one’s friends. In those days the title of general was not so familiar as to be encountered on every hotel register. Besides, the renown of a long lifetime of gallantry in his country’s service had gradually but justly placed General Scott far above all contemporary chieftains in the admiration and hero worship of his fellow countrymen; and in the youthful minds of the West Point cadets of those days Scott was looked up to as a leader whose military abilities were scarcely second to those of a Napoleon, and whose patriotism rivaled that of Washington. Following the lead of the officers to whom I had reported, I was conducted to the room in which General Scott received his official visitors. I found him seated at a table over which were spread maps and other documents which plainly showed their military character. In the room, and seated near the table, were several members of Congress, of whom I remember Senator Grimes of Iowa. Although overwhelmed by such condescension upon the part of one so superior in rank to any officer with whom I had been brought in immediate contact, I ventured to stammer out that I earnestly desired to be ordered to at once join my company, then with General McDowell, as I was anxious to see active service. “A very commendable resolution, young man,” was the reply; then, turning to the adjutant general, he added, “Make out ;lieutenant Custer’s orders directing him to proceed to his company at once”; then, as if a different project had presented itself, he inquired of me if I had been able to provided myself with a mount for the field. I relpied that I had not, but would set myself about doing so at once. Exchanging salutations, I left the presence of the general-in-chief, delighted at the prospect of being at once thrown into active service, perhaps participating in the great battle which everyone there knew was on the eve of occurring; but more than this my pride as a soldier was not a little heightened by the fact that almost upon my first entering the service I was to be the bearer of important official dispatches from the general-in-chief to the general commanding the principal army in the field. I had yet a difficult task before me in procuring a mount. I visited all the prominent livery stables, but received almost the same answer from each, the substance of which was that I was too late; all the serviceable horses had been let or engaged. I was almost in despair of the idea that I was not to be able to take advantage of the splendid opportunity for distinction opened before me, and was at a loss what to do, or to whom to apply for advice, when I met on Pennsylvania Avenue a soldier in uniform, whom I at once recognizes as one of the detachment formerly stationed at West Point, who left with those ordered suddenly to the defense of Washington at the time of Mr. Lincoln’s inauguration, when it was feared attempts would be made to assassinate the president-elect. Glad to encounter anyone I had ever seen before, I approached and asked him what he was doing in Washington. He answered that he belonged to Griffin’s battery, which was then with McDowell’s forces at the front, and had returned to Washington by Captain Griffin’s order, to obtain and take back with him an extra horse left by the battery on its departure from the capital. Here then was my opportunity, and I at once availed myself of it. It was the intention of this man to set out on his return at once; but at my earnest solicitation he consented to defer his departure until after seven o’clock, agreeing also to have the extra horse saddled and in readiness for me. Promptly at seven o’clock I reported at the adjutant general’s office, obtaining my dispatches, and with no baggage or extra clothing to weigh down my horse, save what I carried on my person, I repaired to the point at which I was to find my horse and companion for the night. Upon arriving there I was both surprised and delighted to discover that the horse which accident seemed to have provided for me was a favorite one ridden by me often when learning the cavalry exercises at West Point. Those who were cadets just before the war will probably recall him to mind when I give the name “Wellington,” by which he was then known. Crossing Long Bridge about nightfall, and taking the Fairfax Court House road for Centreville, the hours of night flew quickly past, engrossed as my mind was with the excitement and serious novelty of the occasion as well as occasionally diverted by the conversation of my companion. I was particularly interested with his description, given as we rode in the silent darkness, of a skirmish days before at Blackburn’s Ford, between the forces of the enemy stationed there and a reconnoitering detachment sent from General McDowell’s army; especially when I learned that my company had borne an honorable part of the battle. It was between two and three o’clock in the morning when we reached the army near Centreville. The men had already breakfasted, and many of the regiments had been formed in column in the roads ready to resume the march; but owing to delays in starting, most of the men were lying on the ground, endeavoring to catch a few minutes more of sleep; others were sitting or standing in small groups smoking and chatting. So filled did I find the road with soldiers that it was with difficulty my horse could pick his way among the sleeping bodies without disturbing them. But for my companion I should have had considerable difficulty in finding my way to headquarters, but he seemed familiar with the localities even in the darkness, and soon conducted me to a group of tents near which a large log fire was blazing, throwing a bright light over the entire scene for some distance around. While I had hoped from ambitious pride to have an opportunity to deliver the dispatches in person to General McDowell, I could not decline longer, so placed the documents in Major Wadsworth’s hands, who took them to a tent a few paces distant, where, through half-open folds, I saw him hand them to a large, portly officer, whom I at once recognized to be General McDowell. Then, returning to where I still sat my horse, Major Wadsworth…asked me of the latest news in the capital, and when I replied that every person at Washington was looking to the army for news, he added, “Well, I guess they will not have to wait much longer. The entire army is under arms, and moving to attack the enemy today.” After inquiring at what hour I left Washington, and remarking that I must be tired, Major Wadsworth asked me to dismount and have some breakfast, as it would be difficult to say when another opportunity would occur. I was very hungry, and rest would not have been unacceptable, but in my inexperience I partly imagined, particularly while in the presence of the white-haired officer who gave the invitation, that hunger and fatigue were conditions of feeling which a soldier, especially a young one, should not acknowledge. Therefore, with an appetite almost craving, I declined the kind proffer of the major. But when he suggested that I dismount and allow my horse to be fed I gladly assented. While Major Wadsworth was kindly interesting himself in the welfare of my horse, I had the good fortune to discover in an officer at headquarters one of my recent West Point friends, Lieutenant Kingsbury, aide-de-camp to General McDowell. He repeated the invitation just given by Major Wadsworth in regard to breakfast, but I did not have the perseverance to again refuse. Near the log fire already mentioned were some servants busily engaged in removing the remains of breakfast. A word from Kingsbury, and they soon prepared me a cup of coffee, a steak, and some Virginia corn bread, to which I did ample justice. Had I known, however, that I was not to have an opportunity to taste food during the next thirty hours, I should have appreciated the opportunity I then enjoyed even more highly. As I sat on the ground sipping my coffee, and heartily enjoying my first breakfast inn the field, Kingsbury (afterward Colonel Kingsbury, killed at the Battle of Antietam) informed me of the general movement then begun by the army, and of the attack which was to be made on Beauregard’s forces that day. Three days before, I had quitted school at West Point. I was about to witness the first grand struggle in open battle between the union and secession armies; a struggle which, fortunately for the nation, the Union forces were to suffer defeat, while the cause for which they fought was to derive from it renewed strength and encouragement. Victory at Bull Run – What Was McDowell’s Game Plan? 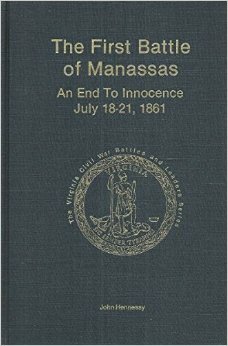 John Hennessy is working on a new edition of his seminal tactical study, The First Battle of Manassas: An End to Innocence, July 18-21, 1861. I’ve corresponded with the author enough to learn that this will be one of the rare updated editions that owners of the original will consider a “must have.” Mr. Hennessy discussed the new book somewhat in a recent interview with Civil War Talk Radio, which you can listen to here. During this interview, you’ll hear the author discuss one of the great mysteries of the campaign – what exactly was Irvin McDowell’s vision of victory for his army (which ex post facto became known as The Army of Northeastern Virginia)? Many authors/historians have made the assumption – and it can only be an assumption – that McDowell envisioned a swift flank attack which would overwhelm his opponent and result in a set-piece victory, rolling up and decisively defeating Beauregard in a classic clash of arms. The definition of victory here is not just semantics. It is critical in assessing McDowell’s plans and actions, and in determining why they failed. I believe victory in McDowell’s mind was something other than what almost all chroniclers and critics of the campaign have assumed. I won’t tell you what to think, but will make a suggestion that may help you think for yourself: the answer can perhaps be found in what McDowell wrote before the battle and in what he did during it. In order to discern that, I think you must cast aside assumptions of what he must have intended and take him at his word – and actions. If you do that, then the inexplicables of the campaign may become more explicable. What appears to be a complex plan (given the traditional assumption of intent) may become less so. Read McDowell’s plans. Look at what he did. Does that jive with your assumptions regarding his intent? To use a sports analogy, would you as a reporter rely on a head football coach’s post-defeat comments about his game plan when you have the actual game plan and video to look at? Especially when the game plan and video don’t support those comments? Post-defeat comments: “We really wanted to establish the running game, but that didn’t work out.” Game plan: we must exploit the opponent’s secondary. Game film: first three possessions each consisted of three incomplete down-field passes and a punt. I was recently going through some older posts, and was reminded of a series of posts from over 4 years ago by Dmitri Rotov over at Civil War Bookshelf. They explore the relationship between Irvin McDowell and William Franklin, and shed some light on the duo prior to First Bull Run (and beyond). Check them out – good stuff. I’ve been hemming and hawing over one of the things I’ve been working on with regards to the “history” of the First Battle of Bull Run these past many months. “Working” is a relative term, and in this case it consists mostly of thinking. I’ve been firming up these thoughts, writing things down, pulling together sources, and most important bouncing them off a few people whose opinions I respect. So here’s the nutshell: I believe that the standard story of what Irvin McDowell was trying to do, and what he expected to confront, with regards to Beauregard’s force outside Manassas – which typically is covered within no more than a paragraph in most (maybe all) studies of the campaign written within the last, oh, say, 90 years – is not right. That is, it is not supported by the primary documents, and it is not supported by McDowell’s actions up to and including July 21st, 1861. Or, at least, there is an alternative interpretation. This is a very complicated case, Maude. 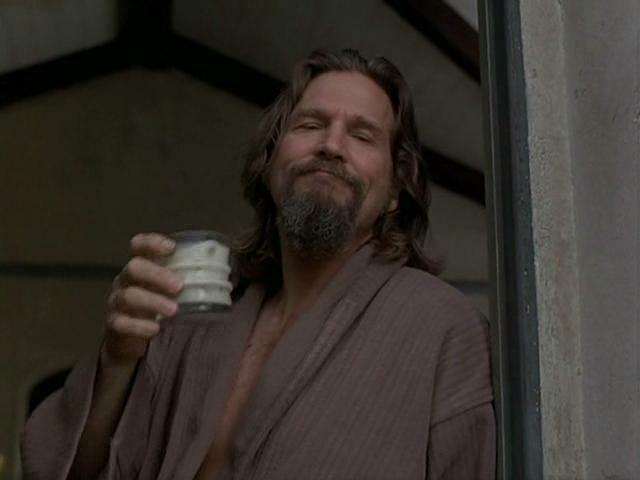 You know, a lotta ins, lotta outs, lotta what-have-you’s. And, uh, lotta strands to keep in my head, man. Lotta strands in old Duder’s head. Luckily I’m adhering to a pretty strict, uh, drug regimen to keep my mind limber. OK, except for the drug regimen it applies (mine is not really all that strict.) Thankfully a few of the assumptions of the accepted line of thought are refuted so thoroughly by the documentary evidence that there’s little room for argument (at least, in my mind.) This weekend I was very encouraged by a knowledgeable and respected military historian who implied, or at least from whom I inferred, that I’m not completely nuts. More on this as we get closer to the big reveal in Columbus come March. 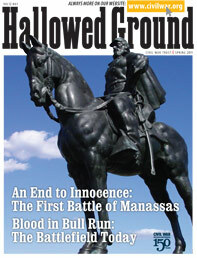 The Spring 2011 issue of Hallowed Ground, the Civil War Trust’s members publication, is out. Happily it focuses on First Bull Run. There’s plenty of good stuff inside on the battle and the battlefield – see here for the table of contents. NPS historians Greg Wolf and John Reid have pieces on some battlefield detective work and the Centennial reenactment; museum specialist Jim Burgess writes on civilian spectators at the battle, and superintendent Ray Brown has an interesting article on the owner of the Van Pelt house. The folks who work and have worked at the park are the real experts on the battles that were fought here. These articles should not be missed – and yes, they’re all available online for free. While I don’t see it listed, there is supposed to be an interview with yours truly in this issue as well. Perhaps I wound up on the cutting room floor? I’ll let you know once I see the magazine itself. While Lincoln and his Cabinet members listened, McDowell laid out a plan to attack the 24,000-man Confederate Army under Gen. Pierre Gustave Toutant Beauregard, deployed near the winding Bull Run creek about 25 miles southwest of Washington. The general intended to use about 30,000 troops in the effort, marching in three columns, while another 10,000 men were held in reserve. With such numerical superiority, it appeared McDowell would overwhelm his Southern counterpart. We cannot count on keeping secret our intention to overthrow this force. Even if the many parties intrusted with the knowledge of the plan should not disclose or discover it, the necessary preliminary measures for such an expedition would betray it; and they are alive and well informed as to every movement, however slight, we make. They have, moreover, been expecting us to attack their position, and have been preparing for it. When it becomes known positively we are about to march, and they learn in what strength, they will be obliged to call in their disposable forces from all quarters, for they will not be able, if closely pressed, to get away by railroad before we can reach them. If General J. E. Johnston’s force is kept engaged by Major-General Patterson, and Major-General Butler occupies the force now in his vicinity, I think they will not be able to bring up more than ten thousand men. So we must calculate on having to do with about thirty-five thousand men. Leaving small garrisons in the defensive works, I propose to move against Manassas with a force of thirty thousand of all arms, organized into three columns, with a reserve of ten thousand. I’ve not yet found any evidence that McDowell expected he would have numerical superiority in his strike against Beauregard. I’ll have more to say on this in an upcoming article in America’s Civil War. McDowell’s plans regarding this are clear, as stated above.